On Monday had a perfect day, with little wind to motor east, past Onassis’ island Skorpios. Further south, we swam at N. Thilla (water temperature 21degrees C). When I say a short swim, you probably get the idea, still seemed very chilly once you jumped in, only the surface was 21 degrees. 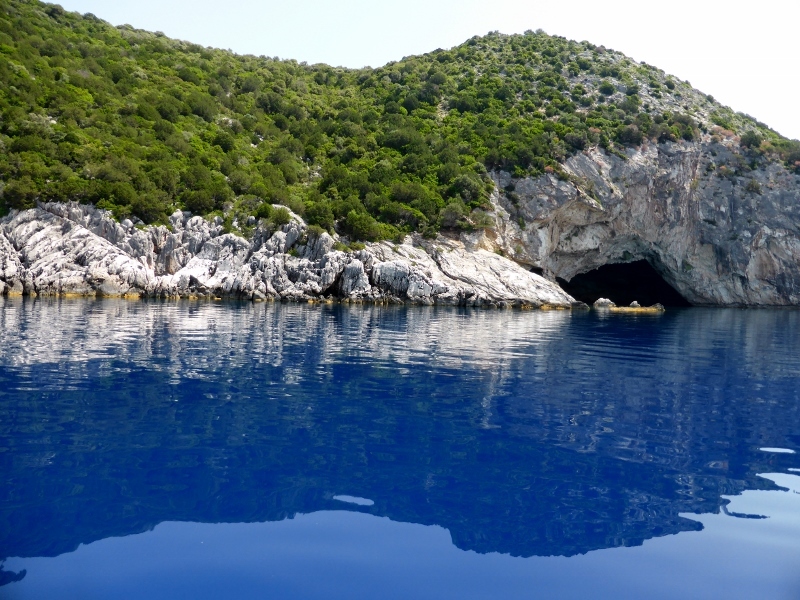 We continued south to Papa Nicolis’ cave, where we were astounded by the depth of the blue water. There are many caves in this area of Meganissi. 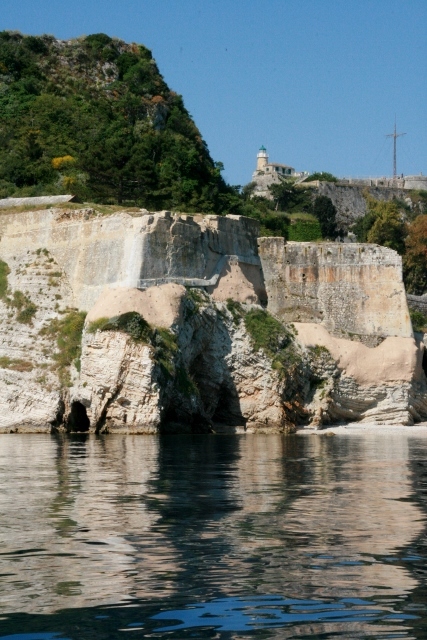 The island is the whitest limestone at the water’s level or stained a pale pink with iron. Mercier motored north to Porto Spiglia, Meganissi a well situated bay on the north of the island. A welcoming party was waving from the dock and we moored stern to along a pontoon, On a pebbly beach there was a large open structure with showers, food and a bar. What a hospitable, industrious family, who never seemed to stop looking after their guests. We walked up the hill to the village of Spartakhori, quite a steep climb, but with a promise of views. The day had finished a bit cloudy but the views were still spectacular. There is a lovely little cafe, with great views, again the patio was just covered with an open air awning. The hand painted sign over the door said Algida, so I thought that was the name of the cafe. Sharron saw my mistaken Facebook post and let me know Algida is the brand for Streets ice cream in Greece. 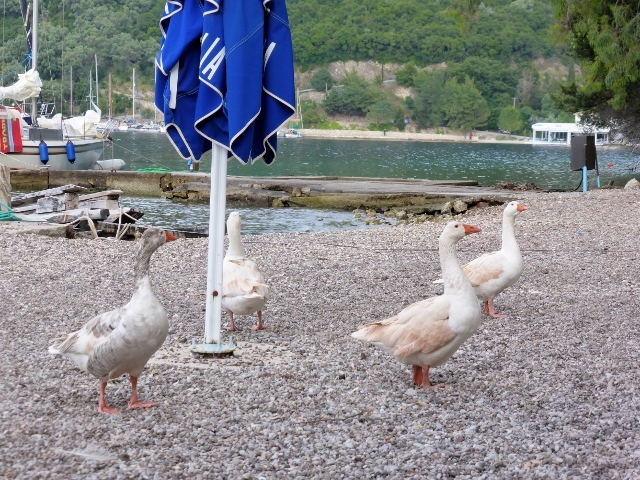 We left for Sivota and found a beautiful little bay but it was fairly shallow. Great Tavernas lined the waterfront, we stayed on the pontoon with the Stravos Taverna, chatted with Phyl and John, who had been visiting Greece for 21 season. They gave us great tips about Kephaloni and Ithaca. 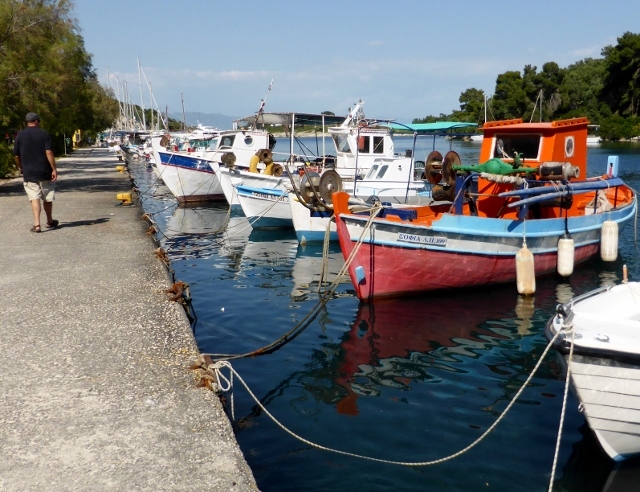 On Friday, we found ourselves motoring to the mainland port of Preveza. This is a non-tourist town for the most part, a working city of Greece. For us it was the right place to purchase a new Manson Supreme anchor. 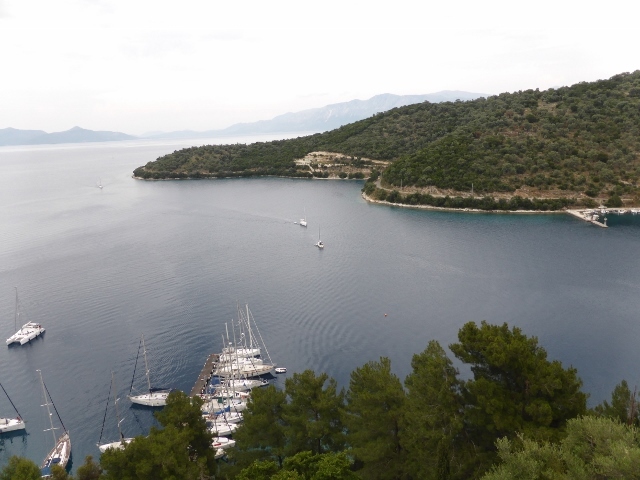 For other sailors, we are finding the Ionian Islands to be a well spring of ship chandlers. We were able to moor alongside the Town Quay and easily lift the anchor onto the boat. Back to Anthony and Cleopatra, about 64 BC, Mark Anthony and Cleopatra came to these isles to fight Octavian Caesar and Agrippa in battle. Despairing of defeat, Anthony and Cleopatra lost their nerve and raced back to Egypt, ultimately to commit suicide. Caesar commemorated his win by building a fortress, Nikopolis about six miles from Preveza. 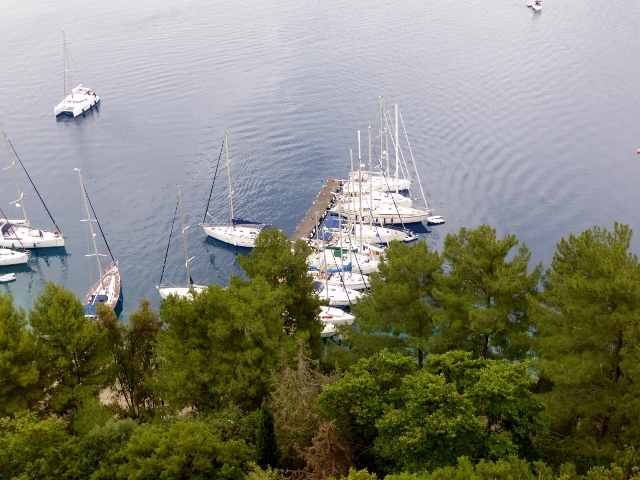 Aptly, the largest marina in the Preveza area is the Cleopatra marina in Aktion across the harbour from the Town Quay. 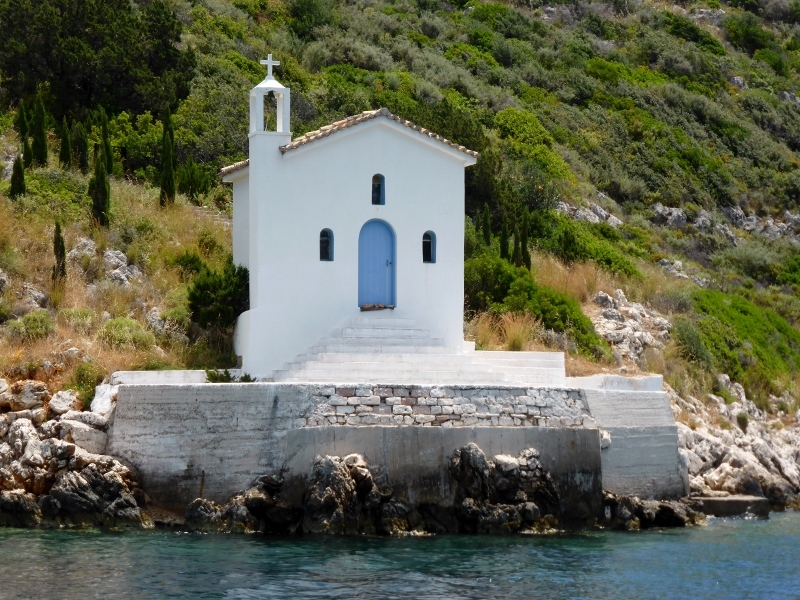 Lefkada is an unusual ‘island’. It is surrounded by canals, which separate it from the mainland and nearby salt marshes. There are a surfeit of bridges, some are artistic and others look very industrial. 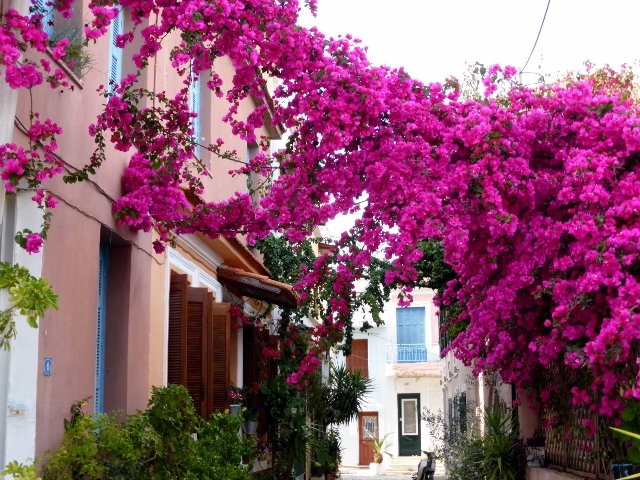 Lefkada is like other Ionian cities and towns with small lane ways and alleys even in the newer areas. 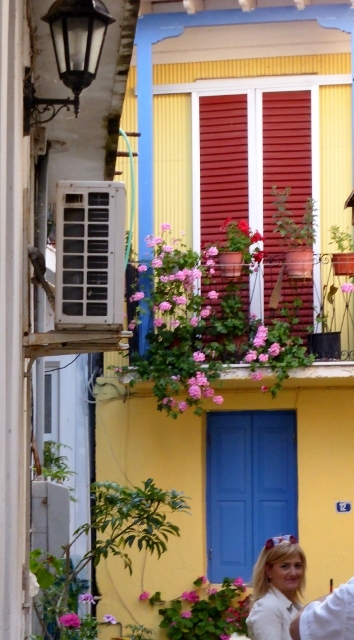 Housing is remarkably different in Lefkada. In 1953 there was a huge earthquake, many towns in the area were leveled. 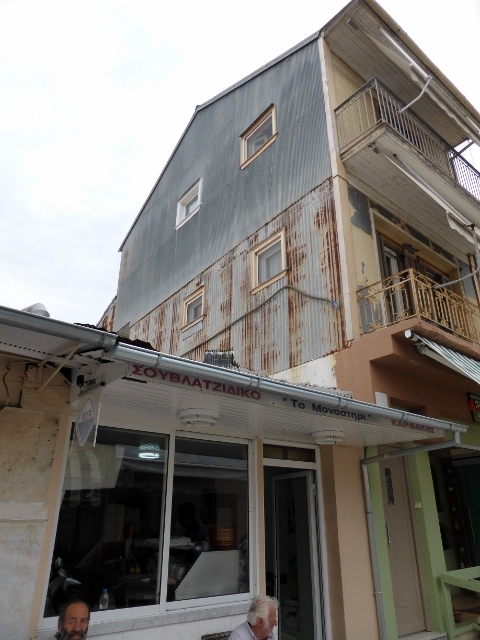 Here in Lefkada, they continue to build the first floor of houses in stone or brick but all of the second stories are built using corrugated iron. There is even an earthquake safe town clock. Between rust, a myriad of colours and graffiti, Levkada certainly has its own style. Yesterday found us motoring over to Lefkada in almost no breeze. 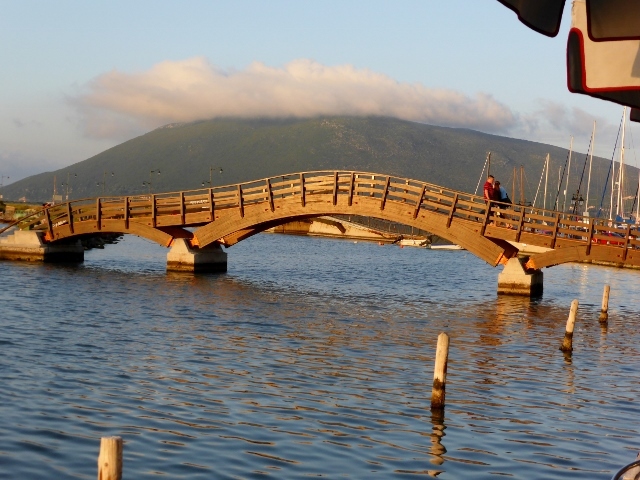 We had to arrive at the canal which separates Lefkada from the mainland, in time for the opening of the “floating bridge” coming past ruins of castles and shallow silt dredged canals. We were very happy for the lack of the wind in these shallows, we had all sails stowed before we attempted to file into the ‘waiting room’ of yachts. This canal was begun by the Corinthians in the 7th Century BC, according to Heikell. Augustus improved it during the Roman occupation, the Turks and Venetians added a bridge and its ruins are nearby. To draw breath here in the Ionians is to absorb history. For two days in a row, we have seen dolphins feeding and one day they seemed to be circling their dinner and then all popping down en masse to grab fish. It was spectacular to watch. They were almost Dervish in their tight circles. Leaving Corfu early on Thursday, gave us superb light by the time we sailed past old Corfu Town. We passed the Venetian Fort and then the New Port and Fortress on our way to Paxos. We were enthralled with brilliant colours reflected in the water. 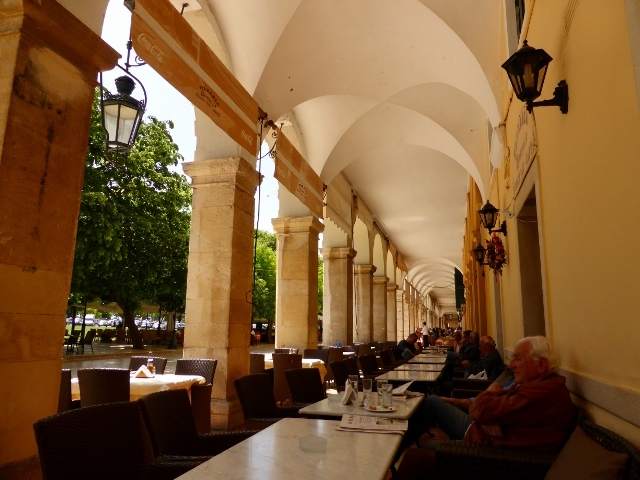 Corfu Town is a modern town with traffic, cricket, shopping areas and Marks and Spencer. 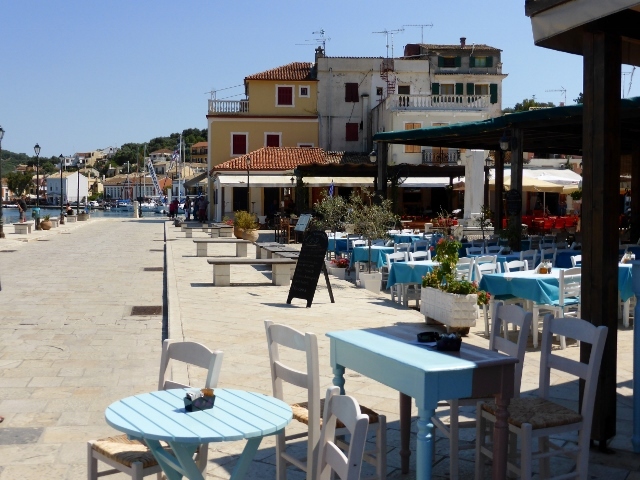 Corfu is full of hustle and bustle until 2:00PM Paxos is not a commercial island. Gaios is the harbour Mercier went into on Paxos. Gaios seemed to be a genuine fishing village with geese flying over head across the breakwater to the islet Ay. Nicholas and fishermen cleaning their nets. We strolled past the fishing boats to the town quay, passing cafes, restaurants and a few shops till you get to the center of the village. You would not have been surprised to see Zorba or Shirley Valentine come from a little back street or alley. We sat at a lovely cafe and watched the ferry head back to Igoumentsia and charter boats come to the town quay and endeavour to moor ‘stern to” early in the season. We consider how pink English tourists are – no interest in sunscreen, while Aussies and many Americans always have their hats and sunnies on. This morning we head over to the mainland to Preveza to collect a new Manson Supreme anchor. Once again the dolphins are off our bow. We have been in Corfu for a few days, mainly going through the formalities of entering a new country. Yesterday, was to be our day to go sightseeing in Corfu Old Town, but we were starting out with a coffee at our favourite cafe, so we could access wifi. James looked up to see our mate and yachting legend, John Valentine, approaching. We were expecting to see John and the crew of Tainui, but somewhere further east. What great luck to see them while we all are still in Greece as they were leaving the next day for Montenegro. We met Maxine, Pasha and Tatiana, all of whom we had heard about from John in Sydney. We have been looking forward to meeting his formidable crew, who had sailed the Volga with John on Tainui. You can read some of their exploits on Tainui.org, John’s blog. For any sailor thinking of sailing the Belomorsk Canal, the Volga, the White Sea, Black Sea and other Russian Waters, these are people to read. Catching up with the Crew of Tainui: John, Maxine, Tatiana and Pasha. 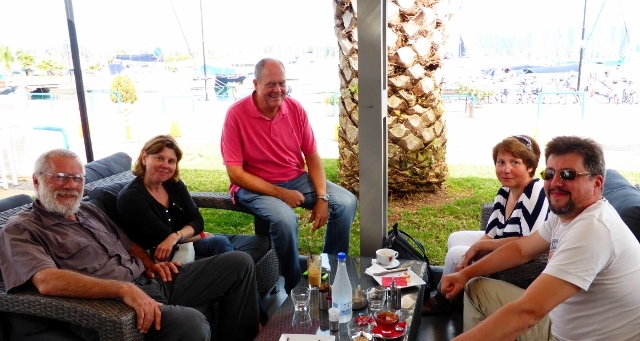 We chatted for awhile, about Montenegro and Croatia, enjoying our coffee and telling them about a book called 777, which an excellent cruising guide to Albania, Montenegro, Croatia and other points along the Adriatic Coast. John gave us some information about ports for us to visit in Greece and information about Marmaris too. He introduced us to Marty, at the next table, who was sailing Canty, with husband Paul and son John from their home port in Camden, Maine. We decided to meet for dinner that evening to discuss sailing. 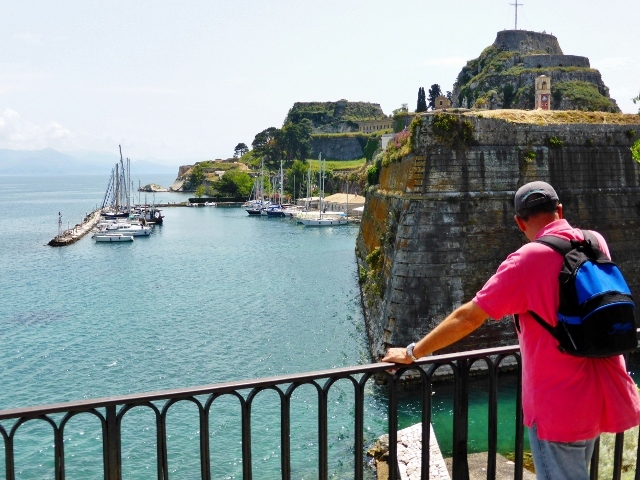 James and I went off to visit Corfu Old Town, the Liston and the old fortress. This town has been influenced by hundreds of years of Venetian rule, a decade or so of French rule and influenced by time spent as a British Protectorate. We walked through the Old Fort and visited the church of Saint George and enjoyed vistas over Old Corfu Town, the Greek Mainland and also Albania, under heavy cloud, in the distance. We saw young cricketers checking out the cricket pitch between the Liston and the car park. The night saw the crews of Tainui, Canty and Mercier tell sailing stories until the wee hours of the morning. Paul and Marty have sailed extensively in New England, Scotland, Ireland and Scandinavia, much chillier climes than we are used to. Fascinating to hear about sailing in such different circumstances. Before we leave Vieste, we should say that we were welcomed by several of the Italian Coast Guards’ finest, including the handsome Captain, who was there with his wife and their adorable son. We have mentioned it was a feast day and even though he had the day off, he was just checking that everything was going well at the office. When he found out we were from Sydney, he told his wife and she asked if we knew her first cousin. She said he lived in Sydney. This happens quite a bit. She said “His name is Joe Tripodi.” James said “Oh yes, he is infamous.” I quietly kicked James in the shin and smiling said “ We do know who Joe Tripodi is, but we don’t know him personally. He was a politician for a very long time.” She nodded demurely and we can see she had been told Joe was famous and important. What is that line about not being able to pick your relatives? 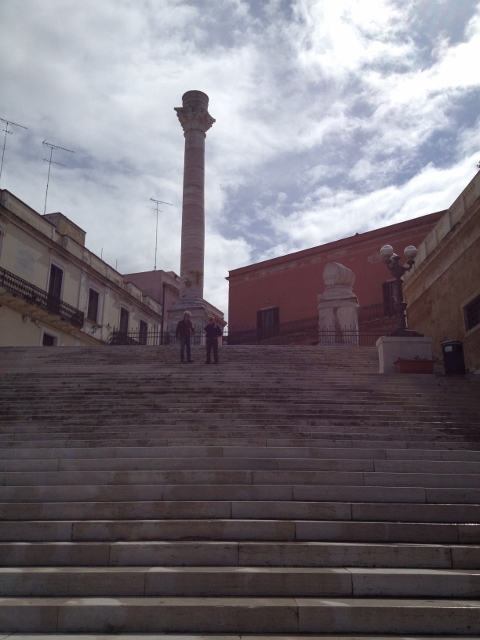 Even though the weather in Vieste was nice, by the time we got to Bari, the weather was a bit grayer. 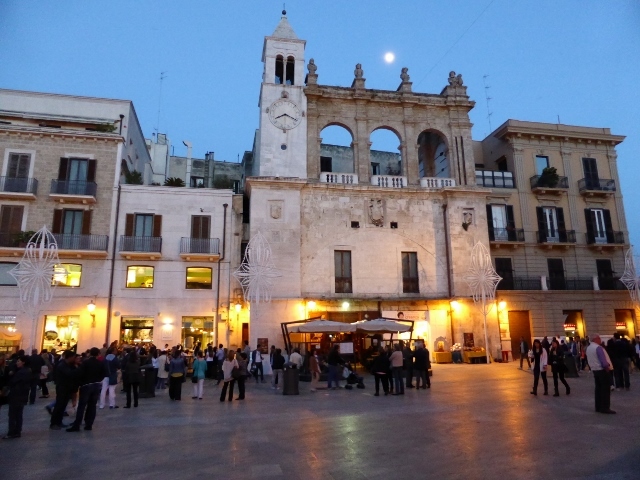 Bari is a big city, with some beautiful old buildings and Centro Storico, but very busy and a bit rough around the edges. We walked quite a bit, found Nespresso, also a great supermarket – Numero Primi and Eataly. All of these made provisioning for the boat easier as the meat, cheese, condiments and pastas were fresh and at Eataly, we were able to have a wonderful lunch with the nicest salad we had eaten for weeks. 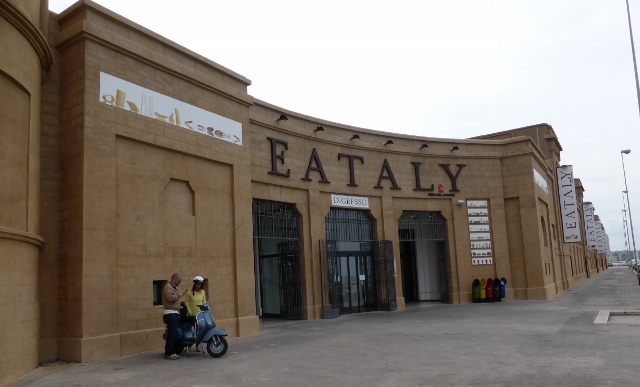 Eataly also had a terrific wine selection of wines from all over Italy, so we think Bari is a good place to provision. We decided that even though the wind was strengthening, it should be safe enough to dash down to Brindisi on Wednesday, because Thursday’s weather was raising red flags. The front came in a bit early and we had 2 meter seas following us on Wednesday, but it was manageable because we were running with the wind. It wasn’t comfortable, but it was safe enough. 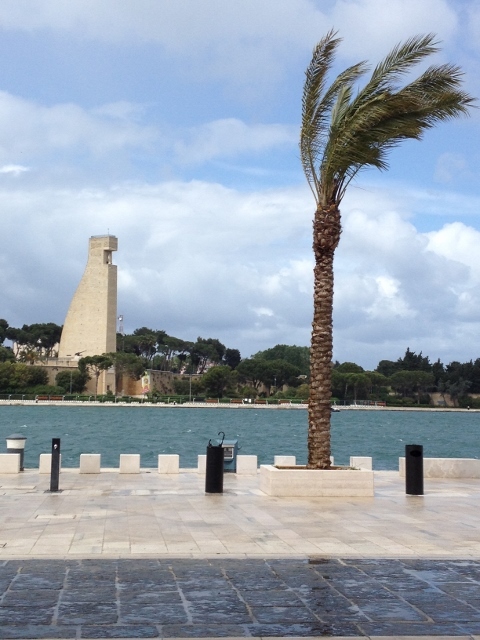 The natural harbour of Brindisi, is famous for being at the end of the Appian Way, famous even before the Roman times. It is such a narrow entrance, it was easily protected. 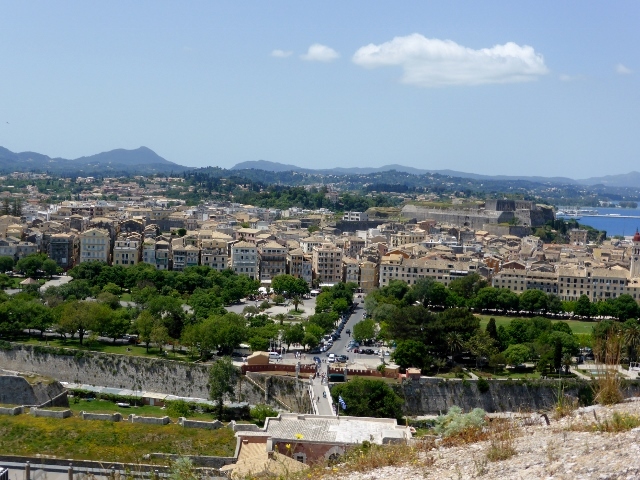 The Brindisi citizens decided that Mark Anthony was going to start a civil war in Rome, so it chained the harbour and denied his war ships entry from Greece. 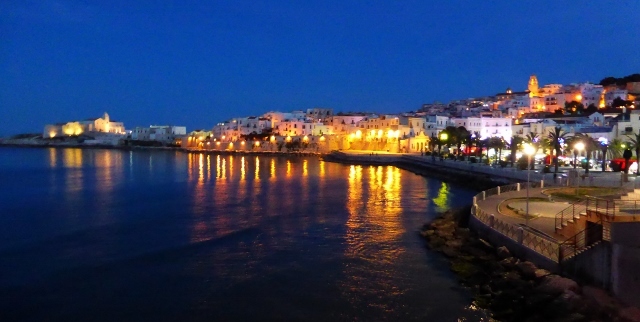 We were thankful that Brindisi’s grand seawall offered immediate safe haven and protection from the rolling Adriatic waves. We had two days to repack and sit out the storm before we would head off to Greece (via Otranto). 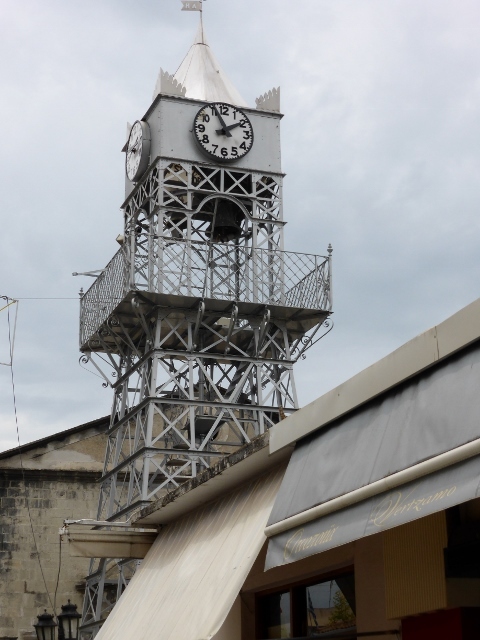 We sailed to Otranto, a medieval walled city and then left early the next morning for Greece. Arrivederci Italia, we hope to be back next year. We have been travelling for a month and first we were so busy with friends and family in the States, we didn’t blog. Recently, when we tried to blog, WordPress was having problems. Today we have had the information and time to get back on track. 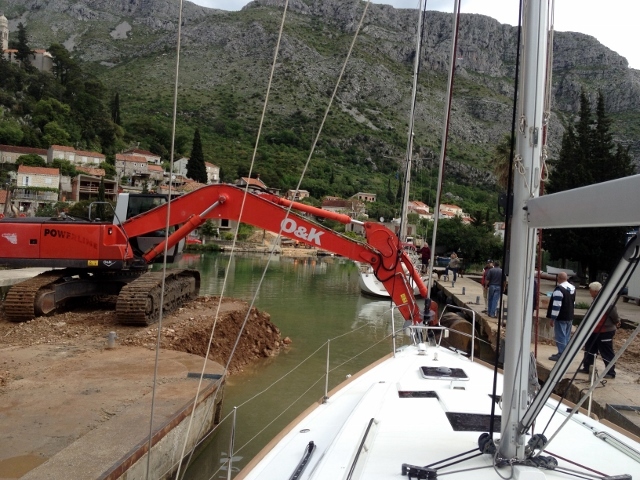 We arrived in Dubrovnik on the 30th April to the news to Mercier was going to be held up in getting back into the water. Up to ten days was the likely new timetable, but luckily there were some Poms who were desperate to get their boat into the water and they persuaded ACI to get both yachts into the water on Sunday, when they wouldn’t be working on the hard stand. They literally had to dig a channel out with the bobcat, so Mercier could motor through. 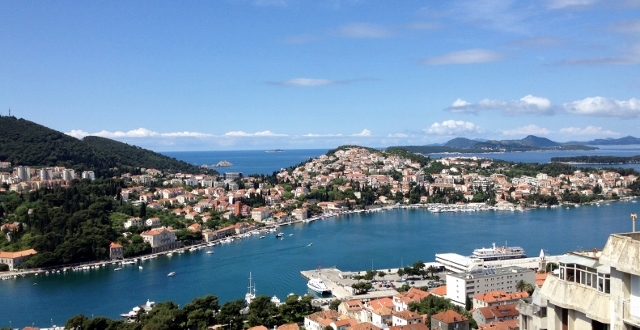 We had a few days to get organised and then we left for a night at Calypso’s in Polace on Miljet and over to Ubli on the island of Lastovo, where we checked out of Croatia and sailed across to Vieste, Italy on Wednesday. The island of Lastovo is one of the most westerly points of Croatia and we spent our last night in a tiny cove with a submarine bunker on a perfectly quiet night, not even a wave against the hull. Vieste, Italy was a lovely, if long, day sail from Lastovo, almost entirely without use of the engine. 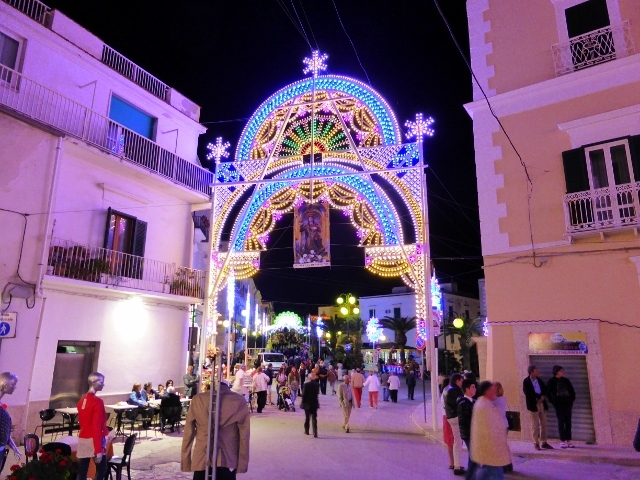 If Lastovo had been quiet, Vieste was lively with the feast of Mary of the Merino being celebrated and the whole town out for the procession of the statue of Mary. 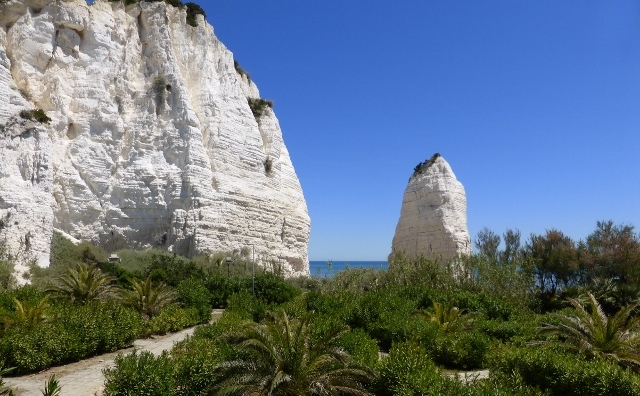 The next day, we started our Italian provisioning strategies in Vieste. We circumnavigated the entire town looking for Sim cards, cheese, spices and wine. The Fornaio or bakery rivaled any on Arthur Avenue, tremendous bread from old large woodfired ovens. 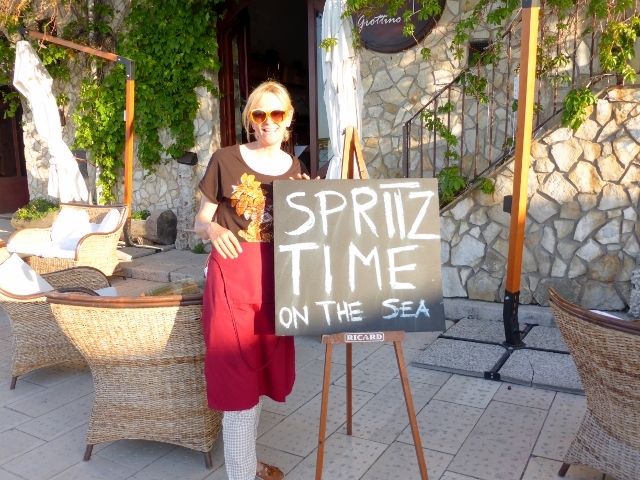 The day was beautiful and we saw a sign offering Spritz by the sea, James and I understood at once, Spring was in the air and the season was starting.